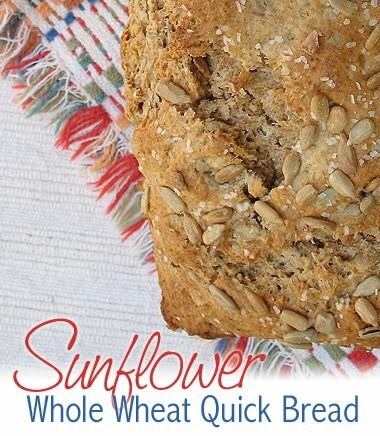 This quick bread, studded with sunflower seeds, inside and out, uses whole wheat flour and wheat germ for a healthy and tasty treat. It is definitely good warm with some butter, but it’s best when allowed to cool completely. 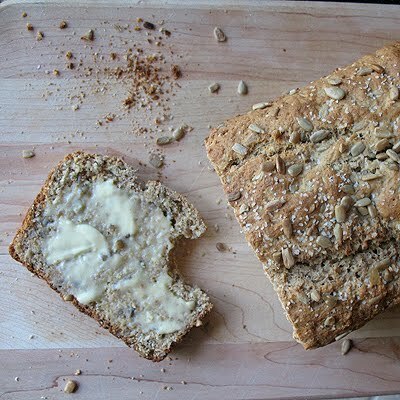 This quick bread has a lovely, nutty flavor with a hint of sweetness which makes it perfect for both sweet and savory spreads. Try a slice smeared with cream cheese, topped with sliced cheese, or as a breakfast treat with your favorite jam or preserves. This is a very easy recipe, and because it’s a quick bread, it doesn’t require any yeast or rising time. 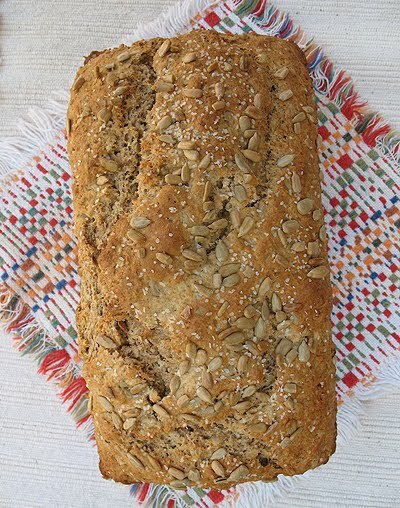 It bakes for about an hour and is perfect for breakfast, lunch, snack or dinner time! I found this in a book I checked out from the library, gotta love that! A very tasty addition to my recipe files. :) I will be making this again! Preheat oven to 375 F. Spray a 9x5 loaf pan with cooking spray. Place prepared pan on a baking sheet and set aside. In a large bowl, stir together both flours, wheat germ, both sugars, salt, baking powder, and baking soda. Stir in 1 cup of sunflower seeds. In a small bowl, combine the buttermilk, eggs and the melted butter, whisk just until combined. Pour the buttermilk mixture into the flour mixture and stir until combined. Mixture will be thick and sticky (like the consistency of cooked oatmeal that needs some milk added to it). 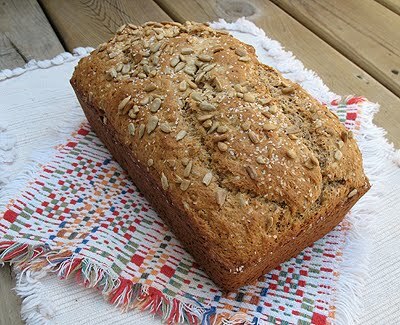 Spoon batter into prepared loaf pan and sprinkle with sunflower seeds and coarse salt. Place baking sheet with loaf pan into the oven and bake for 50-60 minutes (mine was 55) or until the loaf is browned and sounds hollow when tapped. Cool in pan for 10 minutes, then remove from pan and cool completely on a wire rack.